Mural on the Liberty Square. The recently completed $5 million renovations to the Historic Downtown Liberty started a renaissance – one that merchants say they hope will attract William Jewell College students. The renovation updated 80 year-old infrastructure, and the city added new landscaping, lights and benches. It also widened the sidewalks to 14 feet wide throughout the square, making it more pedestrian-friendly and compliant to ADA requirements. The renovations have re-energized the downtown area. 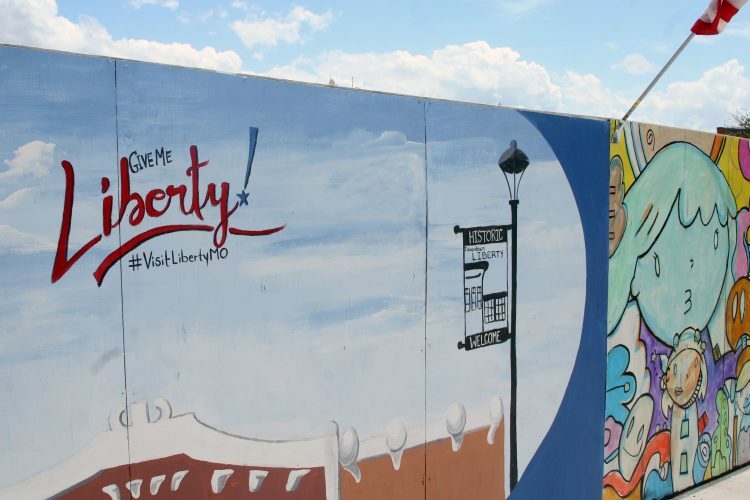 “Now the Square is almost full… (it is) absolutely due to the facelift,” said Rob Jones, president of Historic Downtown Liberty Inc.
Jones was optimistic about a renewed connection with Jewell and its students. He says President MacLeod Walls has been more receptive to fostering community ties than previous presidents. The HDLI is excited about Jewell students being back on campus and hopes they will spend time on the Square. In the past few years, the Square has added more local business that cater to college students like Hammerhand Coffee shop, Rock and Run Bar and Grille and boutiques such as Nickel and Suede and Wild Juniper. The HDLI is looking into creating a discount program for Jewell students at some of the businesses. For instance, Hammerhand offers a 10 percent discount to Jewell students. HDLI is also sponsoring 4th Fridays, which encourages businesses to stay open later on the fourth Friday of each month. They hope this will attract students and other community members to check out stores they may miss otherwise. 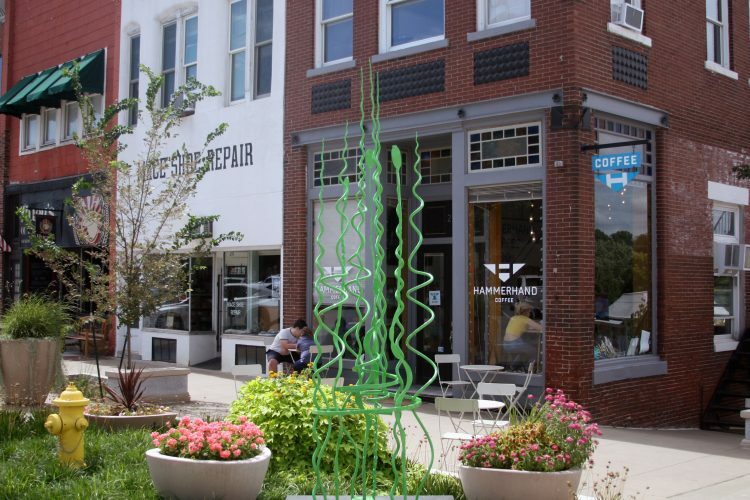 The Square will host its first annual Tea Crawl this Saturday, Sept. 8, from 5-7 p.m. The update also included the new Public Art Sculpture Program. 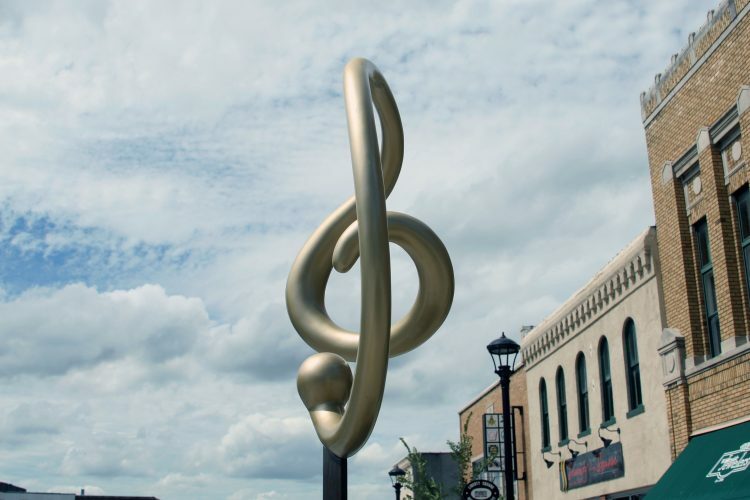 The program, now in its second year, features six original three-dimensional sculptures displayed around the Square. 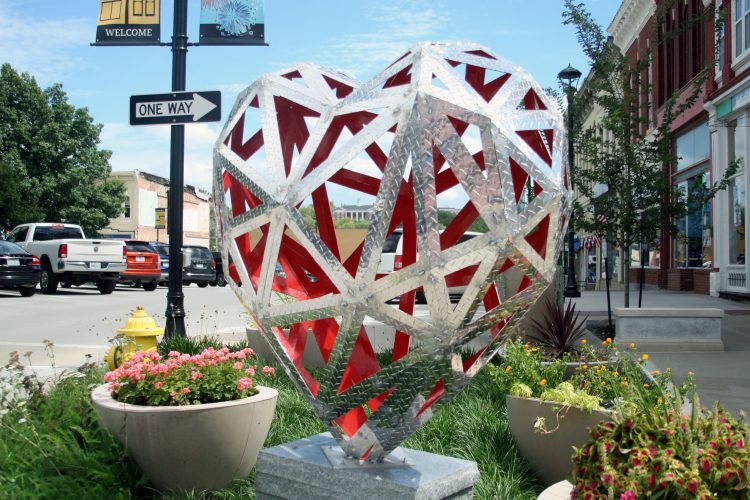 At the end of the one-year period, the Liberty Arts Commissions will pick the most popular sculpture and purchase it for the city. 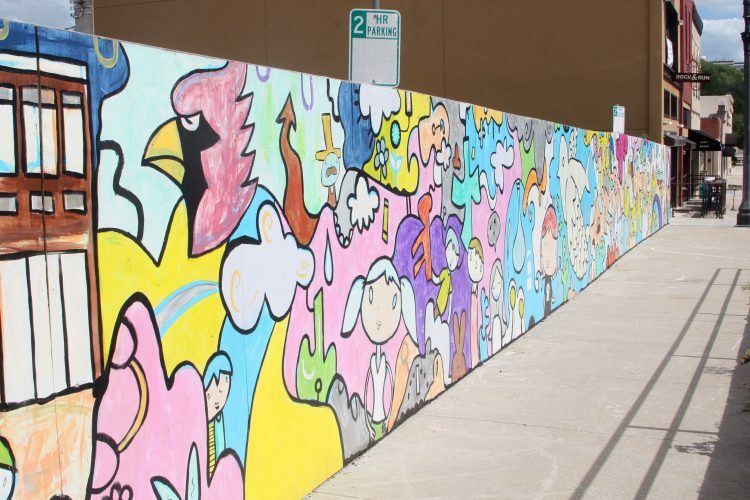 The new sculptures were unveiled in July and will be up for students to look at all year. For students interested in the artwork, download the Otocast app to hear the artists describe their work and vote on which sculpture the city should buy. The updated Square also features the Great American Sculpture Series. The series began in 2013 with a statue of George Washington and was continued in 2016 with Mark Twain. The Arts Commission has announced their next American hero to be embodied will be a woman, though they have not decided on the model. The finished sculpture will be unveiled in June of 2019, in celebration of the 100 year anniversary of the passing of the 19th amendment in Missouri. “It’s about time we have a woman,” said Jones. 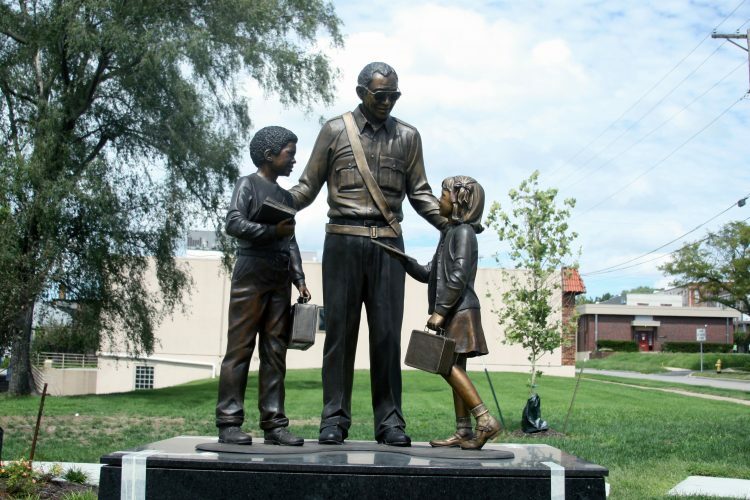 Sculpture of Lawrence “China” Slaughter, a crossing guard in Liberty from the mid-’50s to the early ’80s. A key element of the downtown update was maintaining the architectural integrity of the historic square and establishing the city as a National Main Street member, a subsidiary of the National Trust for Historic Preservation. “Preservation is a hallmark of main street communities,” said Vicki Vance, executive director of HDLI. During the two year project, the design team was careful to maintain as much of the historic charm as possible. They managed to save parts of the large marble markers on the sidewalks at each intersection, and they built the new sidewalks around the remains. While the new programs and improved streets have been popular, some local residents who did not want to be named, had some concerns with the changes. They claim the two-year makeover stripped the town of some of its history. Their biggest criticism is the removal of the brick-lined streets. Some citizens also don’t like the changes made to the large marble markers at the sidewalks at each intersection. Residents also cite concerns about the year-long delays in construction and the frequent flooding and loss of power during the remodel as problems with the update. The HDLI, however, claims the remodel has been a success and has triggered an uptick in business and tourism. The organization did not provide the figures to support those claims as they only began tracking last year. While the Downtown Square has seen huge improvements recently, other parts of Liberty have also had serious upgrades. The new Liberty Commons, located at the southeast corner of I-35 and 152, was finished in July. The $85 million investment boost 15 stores, seven restaurants and is adjacent to the new B&B theater. Jones and Vance are not worried about the new shopping centers in Liberty. They say the differences in the atmosphere of the newer parts of Liberty and the Historic Downtown mean they do not compete for business. While the Liberty Commons is home to well know chain stores, the majority of businesses in the Square are locally-owned small businesses and boutiques. “When you’re shopping here you will probably meet the owner of the store,” said Vance. Jones and Vance, are confident the charm of local business will continue to lure students and other members of the community. “There’s just something about a town square that attracts people,” said Vance.